China and France can carry out "pragmatic cooperation", both bilaterally and multilaterally, within the framework of the Belt and Road Initiative (BRI), said a Chinese government official in a note sent to the Global Times. 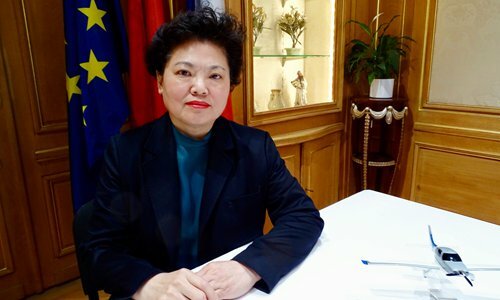 China and France can work together to further deepen cooperation in traditional areas such as nuclear power and the aerospace industry, while expanding cooperation in new areas such as agriculture, finance and the pension industry, said Gao Yuanyuan, minister counselor of the Economic and Commercial Office of the Chinese Embassy in France. For multilateral cooperation, China and France can carry out cooperation in third markets in areas such as the digital economy, artificial intelligence and advanced manufacturing, according to Gao. Chinese President Xi Jinping is currently on a visit to three European countries, including France. "A handshake between great powers always creates more miracles...There's no doubt that China-France presidential diplomacy can create a very positive environment for bilateral trade and economic cooperation. This time, President Xi's visit to France is sure to push the two countries to further develop bilateral economic and trade relations," Gao said. According to Gao, there's great room for China and France to further develop trade as a result of the two countries' strong trade complementarity. China provides ample markets for France's aerospace equipment and high-tech products, as well as increasing demand for French products in the sectors of agriculture, medicine, wine, cosmetics and so forth. China exports labor-intensive products like fabrics, furniture and electronic products to France. China's trade with France surged 19.4 percent on a yearly basis in the first two months of this year to $10.6 billion, customs figures showed on March 8. Enthusiasm is also on the rise among French businesses to explore the Chinese market, with its large population and rising spending power. One example is the agricultural business. "As far as we know, French agribusinesses are very interested in entering the Chinese market. Now France wants to settle the market access problem (with China) for farm products like beef, fruit and dairy products. Government departments in charge in both countries have taken action to find a solution," Gao said. She also noted that French agribusinesses are making product adjustments to cater to the needs of Chinese consumers. For example, French people used to raise cattle that only had lean meat, but after finding that Chinese consumers prefer beef with a little fat, French cattle breeders are making adjustments in the animals' feed and feeding methods to provide marbled beef that better fits Chinese consumers' tastes. Gao also said that the BRI has benefited China-France agricultural trade. "For example, the decision to hold the China International Import Expo (CIIE) was raised during the International Cooperation Summit Forum on the Belt and Road Initiative in 2017. After last year's CIIE, many (French) agricultural products have already been served on Chinese consumers' tables via this platform," she noted.